Flirt as they might, no Richmond bar staff was able to topple Bandito's from its second-year title. Yes, there's the tattooed staff, the women who don't need to bat their eyelashes at you to grab your attention. 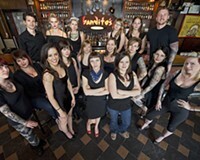 But there's something for everyone, bartender Otto Bartsch muses: "We have redheads, blondes and brunettes. We have voluptuous girls and waifs. We have hipsters, classic pinup looks, girls that tend to have a more gothic look, and even a model who appears in music videos and Madonna controversies." There's a variety of guys, too, he notes. So what's the secret to all the sexiness? "Part of it is attitude," he says. "We are engaging, fun and a centerpiece of your experience. … This isn't the kind of place where the staff is there to be some kind of invisible conduit of food and drinks." Does he find it difficult to work around such sexiness? In a word, no: "I'd find it much more difficult to work without it. The best part of the reputation is that all that sexiness attracts sexiness. If there was an award for sexiest crowd, I have no doubt our crowd would win that one, too." What a flirt.